Will you be having the Urinal Cake, sir? Photo courtesy of Chuck Chamberlain. 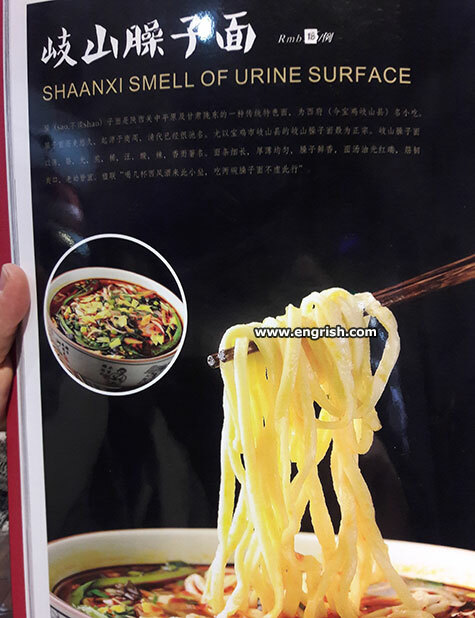 Menu found in Beijing, China. It’s number One on the menu. One order, please…. to go. Seems like the chef got really pissed. What has been said about cooking meat and pees in the same pot. Known for its diuretic properties. Errrr…did I get that backwards? It does look suspiciously yellow. Always keep a pepper pot under the bed. This is number one, on our list of “convenience” foods. Did you hear of the dyslexic vegan? He never need to add salt to his peas. He jammed a large cork in her bower. @Classic Steve .Sort of like the Che Guevara (ˈtʃe ɣeˈβaɾa – Esp) of the goulash? Something tells me it all started with asparagus. The ingredients for this were passed by the Board of Health. The dish is our: Split pee Ghoulish. And by “split” we are not implying, that it comes from Croatia. The chef says it’s a whiz to make. What the heck does surface tastes like, let alone surface with smell of urine?